We’re looking for a new Digital Producer! Could that be you? 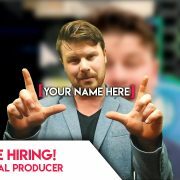 Choc Chip Digital is looking for a new Digital Producer! Exciting news. We are looking for a new Digital Producer to join our team here @ Choc Chip Digital! Salary $60-70K based on candidate’s experience. Position based in our Geelong office. If you, or you know someone who has experience managing web design, digital design or video production projects and teams and loves client relationship engagement and management apply using the link below! The successful candidate will have a working knowledge of internet services, graphic/web design principals, video production management, excellent communication, a creative mind, interpersonal skills and a proven track record of building and managing both production teams and client relationships. The Digital Producer is the key liaison between clients and the Choc Chip Digital Production Team. The Digital Producer is responsible for managing projects from initial client meetings, planning sessions, wireframing all the through to product delivery and post production support periods. Managing the Production Team and ensuring all deadlines and completed on time, with fantastic results for our clients, is the key objective of this role. The Choc Chip Digital office is a dynamic and fast paced environment, the successful candidate will demonstrate an ability to prioritise tasks and complete tasks to a high quality within tight time frames, all the while providing outstanding communication and updates to our clients. Choc Chip Digital is a leading Geelong digital agency. We have been specialising is outrageously effective online marketing, stunning website design, engaging video production and focused branding and logo design for over 15 years. We are a fun, dynamic and tightknit team who love what we do and share a love for all things digital… and Game of Thrones of course. This position is full time for 40 hours per week based at our Marshal office location in Geelong, Victoria. Note this position does not have the scope to be worked remotely, an ‘in office’ presence is essential. This position has an annual salary between $60,000 – $70,000 depending on the experience and qualifications of the applicant, with the opportunity to increase based on strong performance through an annual review structure. Manage the production schedule of current web/video/marketing and design projects coordinating both internal and external production teams, including assigning, tracking and managing tickets through Wrike project tracking software. Liaise between clients and the Production Team and Marketing Coordinator on all matters including design research, project planning, wireframing, design processes, scheduling, resolving issues and invoicing. Manage office phone and email communications including taking incoming calls and directing them to the appropriate team members. Coordinate and direct clients enquires and the resolution of issues through the management of the Production Team. Management of client relationships and project production from the facilitation of the initial planning meeting all the way through to the post production review. Understand and track the services delivered to clients including liaising with the Marketing Coordinator. Broad understanding of DNS (A Records, Name Servers, CNAME records, MX records). Experience in configuring email clients like Outlook and Thunderbird. Basic knowledge of server environments (Cpanel, FTP, File Manager, PhpMyAdmin). Basic knowledge of server types (shared, dedicated, VPS ect). Working knowledge of Wrike project tracking software or similar project management software. A flexible approach to coordinating work in light of new and emerging priorities. Coordinating a small team (desirable). Working in the IT industry- Minimum 12 months. (desirable). Working within Wrike or alternative project tracking software (desirable). Working with Quick Books Online or alternative accounting software (desirable). This is an exciting opportunity to build your career with exposure across a wide variety of marketing and design channels. Please submit all applications via Seek including a current resume and cover letter addressing the criteria listed above. Due to the dynamic and ‘front facing’ nature of this role we want to get a feel for the personality and character of all applicants and ask that you film a quick video 1-2 minute introducing yourself and why you are the best person for the role. Simply use your phone, upload to YouTube or Vimeo and include the link in your application. This video is a casual introduction and will not be reviewed based on its visual or production quality, it’s simply a way to get to know you. Applications close 14th of September 2017. If you have any further questions about this role and it’s requirements please don’t hesitate to get in touch with us by calling 5234 5360 or emailing chris@chocchip.com.au. https://chocchip.com.au/wp-content/uploads/2017/09/DP-JPGG.jpg 720 1280 dev https://chocchip.com.au/wp-content/uploads/2017/03/logo-white-transparent.png dev2017-09-01 07:57:442017-09-04 12:54:58We're looking for a new Digital Producer! Could that be you?